The Paddle Steamer "PS Waverley"
The world's last remaining ocean-going paddle steamer, the truly wonderful Clyde Steamer PS Waverley. She is a picture postcard image of Glasgow that every Glaswegian knows and loves well. She represents a historic time when tens of thousands of people would take day trips or go on holiday "doon the watter" on these wonderful steamers. If you go on board today for a trip on the Clyde, talk to an older person who will tell you just what this ship represents of Glasgow and the River Clyde's history. The PS Waverley is the last one, and she needs all our support. She is supported as a registered charity through the Paddle Steamer Preservation Society. Take a trip on her, join the Society and find out why so many people love her! You will be helping to save her, but you will also have a tremendous time and go home with special memories. Spend your money on board - don't bring your food & drink with you - you can do more than just spend a penny while on board! 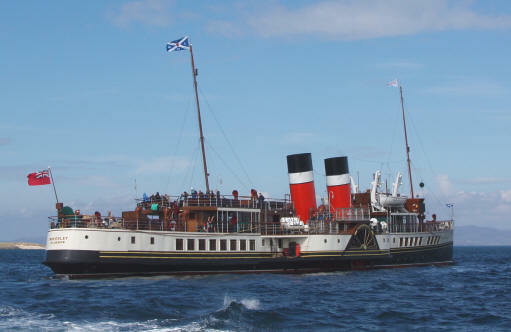 In recent times, Waverley has had many millions of pounds spent on her as part of a massive project to renovate her and to bring her up to all the latest safety standards. She is now better than ever and looks tremendous. Take a stroll on her teak decks or sit on a teak bench enjoying the passing scenery, chatting to fellow passengers, while enjoying a drink from the upstairs tea shop or downstairs bar or restaurant. You can sit along the sides, between the funnels, right up at the bow, right at the stern, or "up top" at the stern for an amazing view right around the ship. 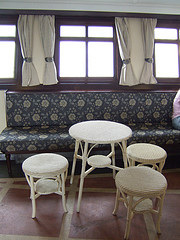 You can also sit in the 'observation lounge' on the promenade deck to keep out of the wind & rain. Make your way to the large, comfortable bar, where you can usually enjoy a live band or maybe have a dance if you feel in the mood! 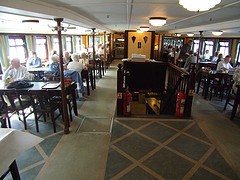 The bar was rebuilt and redecorated during the recent refits entirely in keeping with the ships 1940s character. Enjoy afternoon tea or a full hot meal with a glass of wine from the wonderful Art Deco restaurant with large scenic windows.On my recent trip, I enjoyed sitting here having rather good fish & chips, while listening to the lovely steam whistle blowing up above me! The wonderful lower bar is a special wee place to take a dram or two! The portholes are very low to the water, and when the ship rolls, they can go underwater! Now how many bars can you say THAT about!? The engine room should not (and literally cannot!) be missed. Watching the giant triple-expansion steam engine go about its beautiful business, while also observing the paddle wheels through the portholes is highly entertaining. The toilets! Surely they have the best view on the ship! 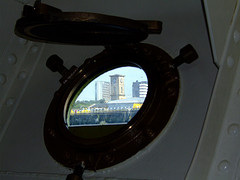 They are alongside the giant paddle wheels and have a row of portholes looking out on the water. Gents need to be careful not to pay too much attention to the passing scenery!! These sites contain full information about Waverley, I haven't even attempted to repeat this information on my page here. The official Waverley Excursions Website. Book your trip here, or view a timetable. You can also book MV Balmoral - a wonderful ship that runs in support of Waverley. By travelling on Balmoral, you're also helping to support Waverley. 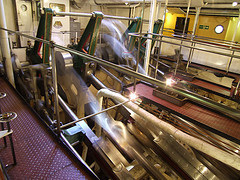 The Paddle Steamer Preservation Society (Scottish Branch). 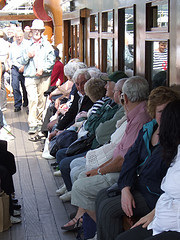 The Society supports Waverley Excursions in the operation of the ship. Join and/or donate now to support and save the Waverley! Ships of CalMac - Waverley History - a fascinating read.